While I have done a modest bit of glass cutting for my own stained glass projects, it certainly is not my forte, nor do I have the shop for it; switching between wood working (with steel tool surfaces, loads of dust, and 50-pound boards) and delicate small sheets of glass just wasn't working. So I went searching for a glass supplier, and came across Bradstreet Glass on Etsy, a small business run by Debbie Koenig, based in Florida. I had to attend a session of my aunt’s stained glass class after school, and I had brought a book since she warned me I would be bored. I was not at all artistic – math and science were where I was most comfortable. But I was drawn to the process: cutting, grinding, foiling, soldering…and I gathered a lot of my aunt’s scraps from the table, arranging them together like puzzle pieces. She let me use her supplies, and by the end of the session I had made the ugliest sun catcher in the whole world. After high school, Debbie entered the Air Force and became a Contracting Specialist, both in the service and afterwards, with a number of roles in procurement and contract management in Texas. But the jobs were incredibly demanding, always forcing her to put her family and any personal interests second, and she found herself developing health issues as a consequence. It all came to a head when her last manager asked her to put a deadline above her daughter's visit to the emergency room; with that conversation, she was ready to make some changes about her priorities. 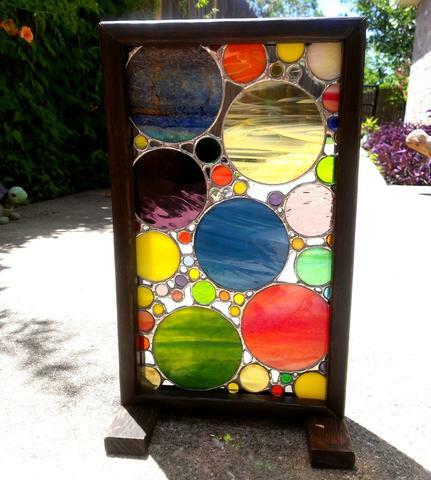 Remembering how much I enjoyed making that hideous suncatcher when I was 16, I went online and ordered a whole stained glass workshop: grinder, cutters, breakers, foil, solder, solder iron, flux, brushes, and a box of stained glass. I set up everything, and I decided to take a week or two off before I looked for another job – preferably in another field, I really had no idea...I thought it might come to me. And I started making sun catchers. The next week was great, listening to music in my garage, drinking vodka and red bull, and thinking up designs, patterns, teaching myself techniques and learning something brand new and different. I had never even tried to work with my hands before. By the end of the week I had made several things and was teaching my husband, Allen. He loved it and had a ton of ideas himself. I really wanted to keep spending my time this way. So I figured that if I sold some of these things, I could stretch my money out longer and do this for a while. I created the Etsy shop, “Jodeliece Bradstreet’s Glass House” – I don’t know a Jodeliece, or a Bradstreet, but the name had come to me in a hot shower after said vodka and redbull, and I decided it was good. And my friends started telling me about local markets where I could sell crafts. Debbie's business plan has evolved from there, selling supplies, glass sheets, and precut glass for other artists like myself, and more-involved but amazing finished panels. She's since moved to Florida, and ultimately hopes to open a shop that can also serve as both her own studio and as a place to teach stained glass to others and feature other artists work. Debbie's commitment to quality and customer satisfaction is second to none. I could share many anecdotes to illustrate this, but perhaps the best one is in fulfilling a recent order for some custom glass, the pieces she sent me were 1/32nd of an inch too large, which - though I had a 64th of an inch I could expand into, made the piece too big by a 64th. Now - keep this in mind, my loyal readers - if anyone ever tries to return something to me for a dimension off by that much (errr... that little), I'd probably start screaming! But Debbie accepted the return, ground the glass down to spec, and returned them less than a week later. And all with a smile! So should you ever need stained glass supplies, cut glass, or a beautiful finished panel (she also does commissions!) - I implore you to give Debbie a call! The pieces that feature Debbie's work are my night lights and backlights, and a few more unique pieces to come - check them out here. It may seem a little odd to be listing a contractor here, but keep in mind I also do commissioned pieces, both as freestanding furniture and for built-ins. I've done two jobs for Mike Miranda, the owner and contractor behind MEMGC, most recently a breakfast nook storage bench for a high end remodel in San Francisco. I'm definitely grateful to Mike for bringing business my way, but were that the extent of our relationship, I would not feel comfortable making a public and personal recommendation for a general contractor. But he has also done several jobs for me as well, including replacing a failing structural beam in my own home. So I have personal experience with him as a customer, in which he stands out as honest and professional, delivering quality work at a reasonable price. And extra bonus he's always on time for our appointments, a rarity in the contractor world. For that alone, he's worth a gander! Moment frame, overkill for a small residence! Replacing a 24' beam is a project far beyond my capabilities - I don't even know where to begin. I had bids ranging from a few thousand dollars to over forty thousand, with no understanding on my part of what was necessary or required and little explanation from the contractors providing the bids about what was involved, until I was connected with Mike. Mike outlined the range of possibilities that the city might require, everything from a "simple" brace & replace, to a trenching for a full moment frame. Rather than bid outright, he suggested I look up past permits to verify the legality of the existing work, and then talk to the building department to understand their requirements. The half hour conversation with Mike and two hours of investigation with the city saved me tens of thousands of dollars, as the city confirmed they only needed a simpler type of repair. It was during this job that Mike saw my workshop and few of the pieces of furniture I had completed, which then lead to him engaging me for some custom work on his larger projects. His honest advice is a pattern: as he has come to understand my capabilities for home repairs, he has advised me on other pieces of work I've considered, offering to bid on it, but freely giving me tips on how to do it should I want to do the work myself, and so I've done some both ways, tackling larger jobs than I previously thought comfortable due to his expert guidance, but engaging him on a few other projects where my tools, time, or confidence was just not there. Finally, I would be remiss if I didn't also mention that as I was contemplating my next career move when I was still at Google, Mike met me for breakfast, entertaining my many naive (and perhaps a few more insightful?) questions about the day-to-day of his career and his career path. I am very grateful to Mike for taking the time out of his morning for that conversation. Should you ever need any work done, roughly Berkeley to San Mateo, whether its a seismic reinforcement, a whole house rebuild, or a kitchen upgrade, I unreservedly recommend a call to Mike at MEMGC.